With the help of volunteers, the Natural History Museum of Denmark at the University of Copenhagen is digitising the images and data of two million butterflies in an initiative to shed light on how nature has changed over time and how climate change might effect future transformations. The butterfly digitization project is the first step of a complete digitisation of the Natural History Museum of Denmark’s collections. More than two million butterflies collected from around the world over the past 250 years are stored at the Natural History Museum of Denmark. Each insect has a little story to tell about the state of nature at a specific time and place. The collection is being digitised to provide an easy to access catalogue for researchers or anyone else whose curiosity is piqued by butterflies. Less than two percent of the Natural History Museum’s collections have now been digitised and are available for public access. Digitisation of the butterfly collection marks a continuation of this important work. It was no coincidence that butterflies were chosen. "We are digitalising the butterfly collection because butterflies are sensitive to the slightest of environmental disruptions. Butterflies serve as a barometer that informs us about changes to nature, such as when a population suddenly disappears. These delicate creatures house a wealth of information that, among other things, can provides clues for how nature may respond to climate change in the future," explains Associate Professor Thomas Pape, of the Natural History Museum. Crowdsourcing is used when a network of people is recruited to collectively help with and accomplish a specific task. In this case, the task involves recruiting Danish volunteers to interpret the butterfly labels. "The task is simple: it is primarily to document when and where each butterfly was collected. The task is too large for us to complete on our own, so we definitely need the public's help to ensure the success of the project,” says Anders Drud Jordan, Head of Digital at the Natural History Museum of Denmark. Approximately 14 million specimens can be found in the Natural History Museum of Denmark’s collections, including an incomparable diversity of skeletons, animals preserved in alcohol, insects on pins, plant herbaria, fossils, minerals, meteorites and more, from Denmark and around the world. Along with the butterflies, this universe of specimens contributes important knowledge about nature. "The digitisation of our national collections allows us to share our collections with other natural history museums around the world. We are contributing to a unique digital compilation of global biodiversity that provides international researchers with an opportunity to study the distribution of plants and animals on an entirely different scale, one that opens up completely new research perspectives," says Anders Drud Jordan. The Natural History Museum of Denmark is working with the Department of Computer Science on new, computer-driven digitisation methods. The hope is that the process can be completely automated in the future. 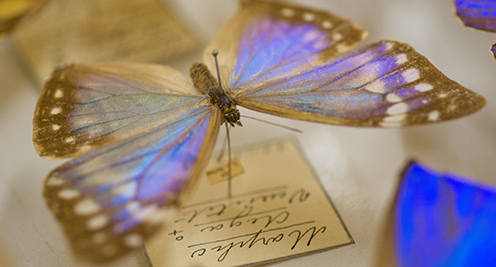 The museum's digitisation process can be experienced in a unique space where visitors will be able to get up close and contribute to interpreting the butterfly labels. This will begin on Friday, October 5 when the museum’s ‘Butterflies - nature’s quiet messengers’ exhibition opens.